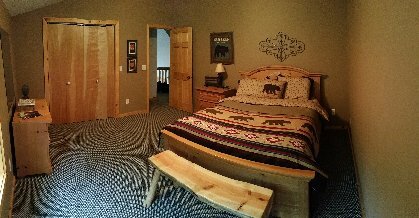 still available for the Sturgis Rally in 2018.
available just before and right after the rally for those that like to visit during those times. 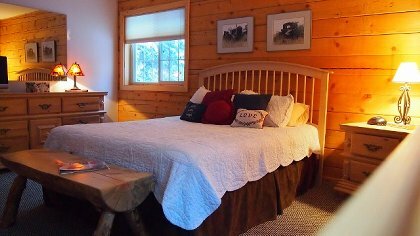 Please call for rates during these times and Relax in style in this 2400 square foot log cabin. Hills with a mild climate and beautiful mountain scenery. Head that hangs on the Great Room wall above the fireplace. Rally and cities of Sturgis and Spearfish are just 20 minutes. the great room and a large deck with a gas grill. 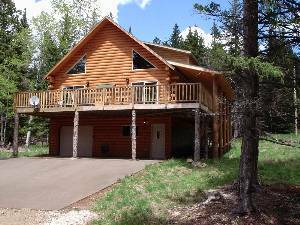 The cabin is just off a paved road with easy access to all areas of the Black Hills. minimum stay. Sturgis Rally excluded. Weekly rate is $1250 to $1500 per week. Many dining experiences in the area. Black Hills Cabin at Terry Peak only five minutes from Deadwood Lead. Leather furniture with log tables and cozy gas fireplace. "Wicki Moose" above the fireplace. This is one of my favorite places on earth to take my family. We have stayed here several times. Beautiful, peaceful clean and well maintained. Great location for touring the black hills. Easy 5 star rating. My family and I stayed at the Wiki Moose Lodge over President's weekend '09. 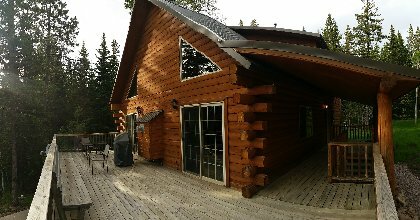 The cabin is in a great location from the Stewart Lodge on Terry's Peak. This was our first time skiing the Black Hills and will definitely return and stay at this cabin again. It is maintained in great condition and had all the amenities we wanted. The owner's are very good to work with and were very helpful and accommodating with any inquiries we had. I would highly recommend this cabin to anyone. 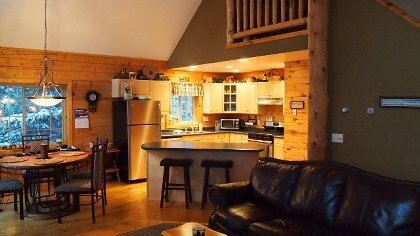 A spectacular, clean, and private get away! 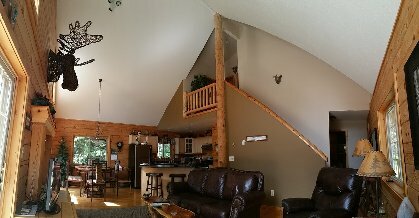 This cabin was in tip top shape and pictures don’t do it justice. Very well maintained and we found everything we needed to make us feel right at home. I would highly recommend this property to anyone wanting to stay in the area of Lead or the near by ski resort. However, a bit of caution should be noted when accessing the home…it’s rather hard to find and especially at night if you aren’t familiar with the area. Rates are for up to 6 people. This is set up for privacy so each of 3 floors would have their own bedroom and private bath. For rates for more than 6 persons and other dates please call. Phone Margaret at 605-348-4660 Ask for discounts for off peak times in the fall and spring. Deposit: We may require a refundable cleaning/damage deposit, paid at confirmation of your reservation. If cabin is left in good condition your deposit will be refunded upon inspection. Cancellations and Refunds: 50% down to confirm your reservation, balance due 30 days prior to your arrival All non-refundable. Other Fees: No cleaning fee with a three day or more rental. There is a charge for a two day rental.